I recently discovered that Austrian pumpkin seeds are much bigger and darker in colour, have more substantial flavour and are creamier in texture than regular pumpkin seeds sold in the UK. 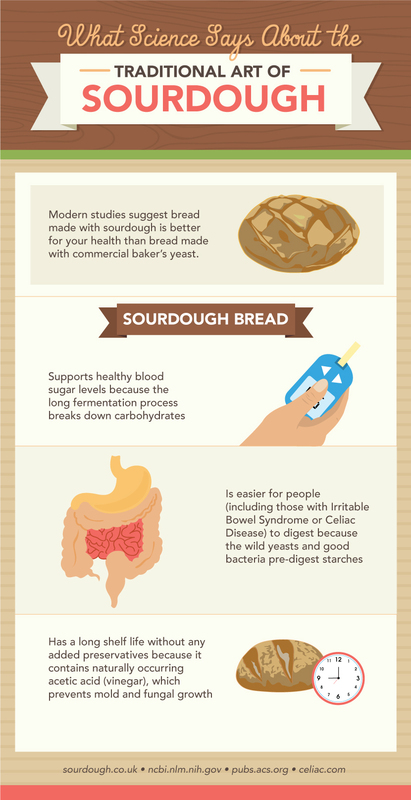 Reason enough to bake one tasty pumpkin seed bread! The largeness of Austrian pumpkin seeds makes them an attractive addition to many dishes. 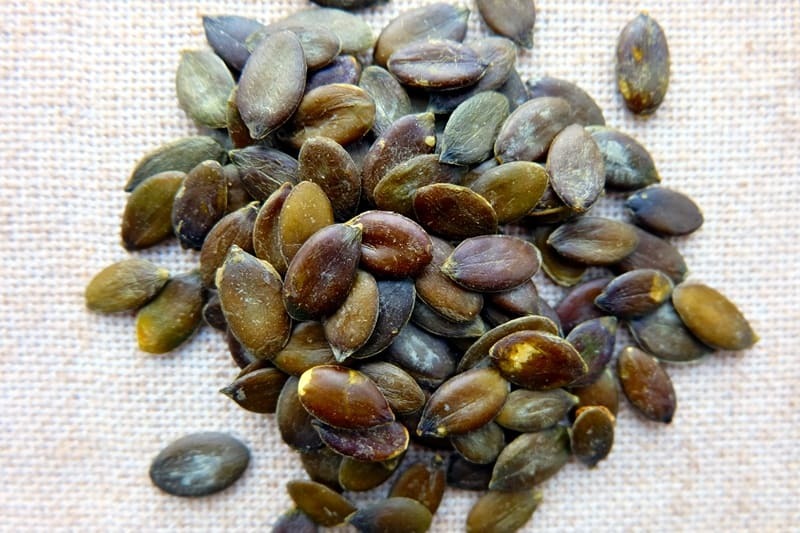 I love adding these pumpkin seeds into sourdough breads, but they are also great for snacking, salads or homemade granola. Take a look below, they look stunning, don’t they? 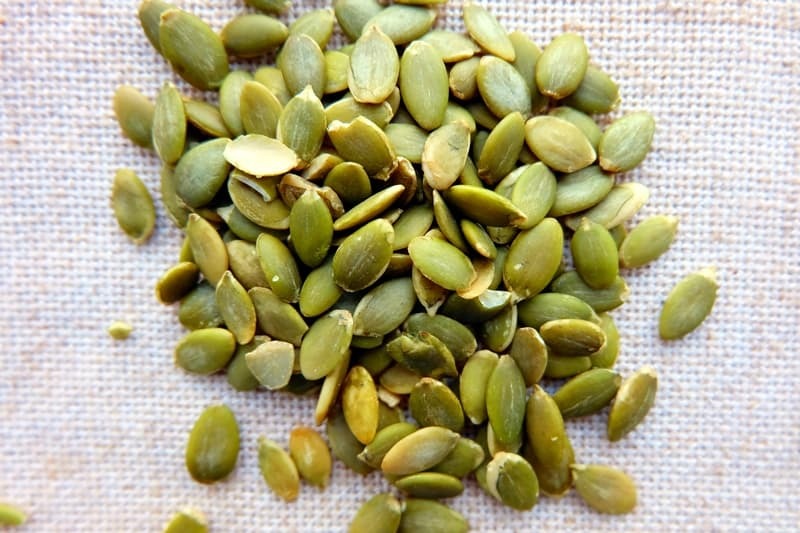 Austrian pumpkin seeds are grown organically in Austria, in the region of Styria. The Styrian pumpkin variety are grown for their hulless seeds alone, while the pumpkin pulp is used as fertilizer on the fields. The seeds are also made into oil and make a popular foodie gift to bring back from an Austrian visit. Austrian pumpkin seeds contain many valuable nutrients, including polyunsaturated fatty acids, vitamin B1, B2, B6 and numerous minerals such as iron, calcium and magnesium. Most notably they contain phytosterol. Several studies show that phytosterol helps with prostate and bladder conditions. 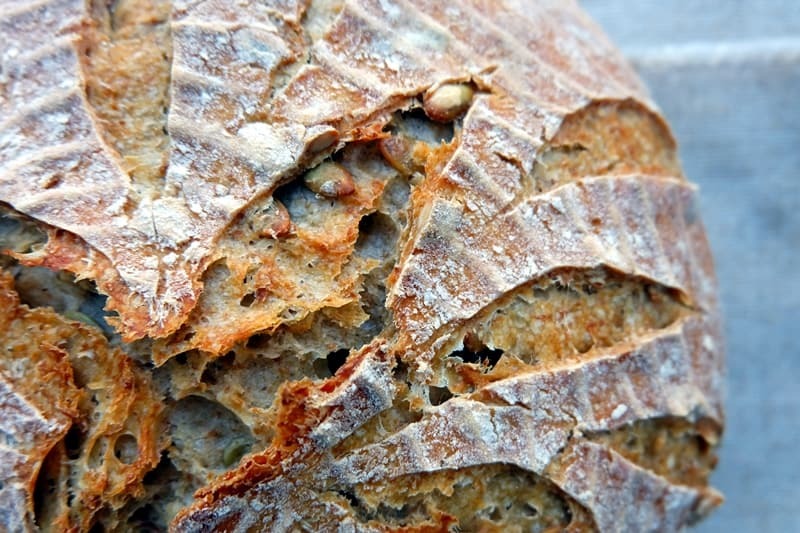 I use both wheat and a small amount of wholewheat flour in this pumpkin seed loaf recipe. 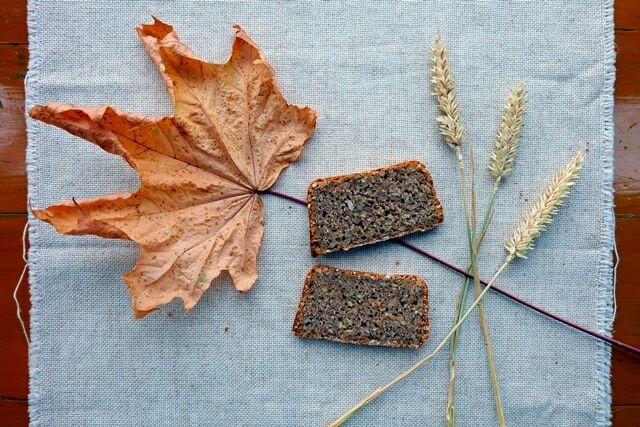 Maize flour is added to give the bread a slightly yellow colour, a picturesque contrast to the green of the pumpkin seeds. 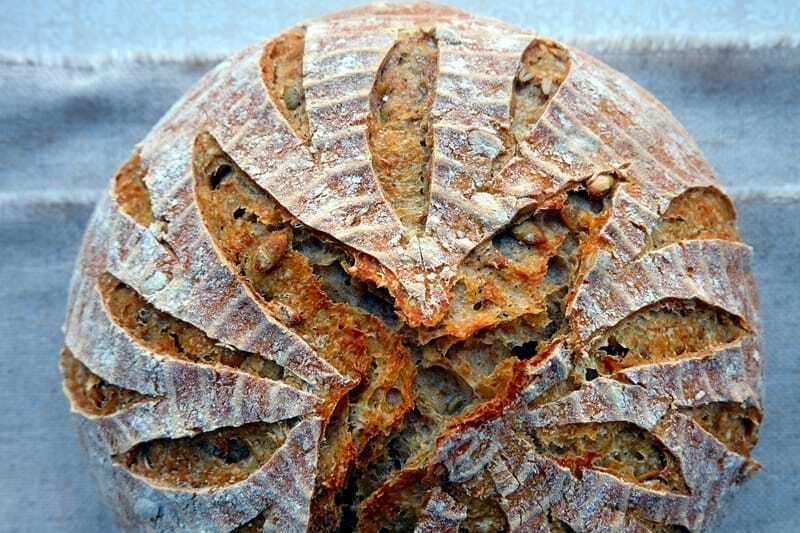 This delicious pumpkin seed bread recipe is a winner for any occasion. Delicious for breakfast with butter and jam, for a savoury platter of cold cuts and cheeses, or for dipping into your favourite soup. 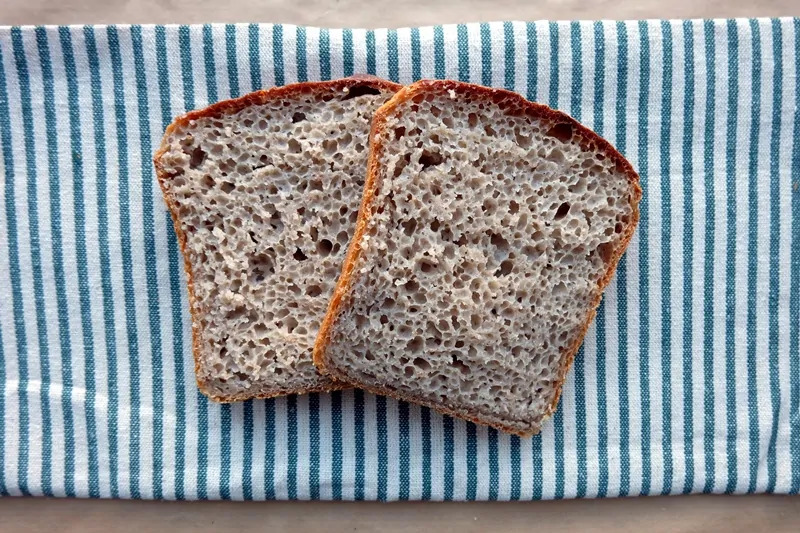 Prepare the sourdough on day 1 by combining the sourdough ingredients in a medium bowl. 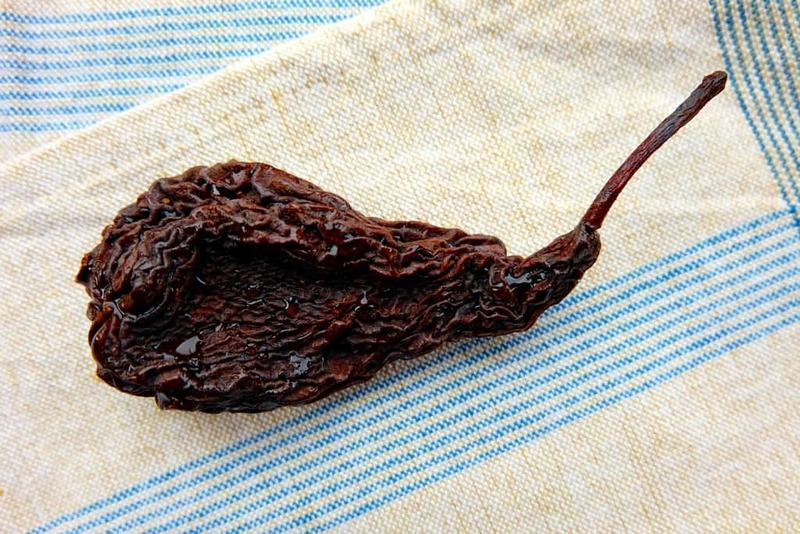 Mix well, cover and leave to rest at room temperature for around 12 hours. On day 2, dry-roast the Austrian pumpkin seeds in a frying pan until they start to pop and smell nutty. Combine 310g of the sourdough starter (the rest goes back into the fridge for future bakes) and the main dough ingredients - with the exception of the pumpkin seeds - in a large bowl. Knead for about 10 minutes, then add the pumpkin seeds. Work in the seeds until evenly distributed. Place the dough back into the bowl, cover and leave to rest for an hour or two until the dough has risen visibly. Punch down the dough, shape into a round, flour the surface and place face-down into a pre-floured proving basket. Preheat the oven to 220°C half an hour before baking. If you use a La Cloche baking dome, preheat this in the oven from cold. Once fully proved (after several hours in my kitchen but this will depend on the temperature in your room), turn out the bread from the proving basket onto the hot La Cloche plate. Put the La Cloche cover back on and bake for 10 minutes at 220°C, then turn down the heat to 190°C for another 40 minutes. 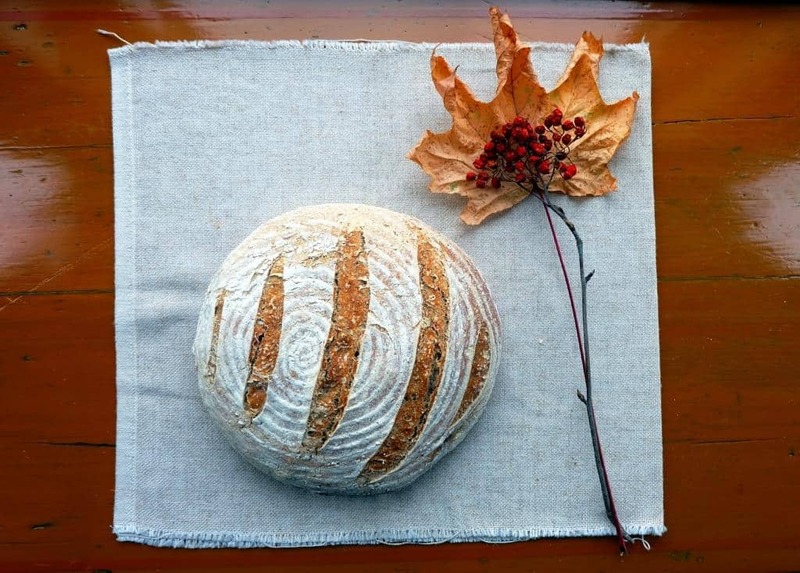 Take off the La Cloche for the last 10 to 15 minutes. 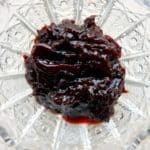 Quite a few Austrian sweet dishes and puddings are filled with a jam-like plum spread called Powidl and I thought it would be useful to devote a quick feature to this delicious preserve. You’ll find Powidl in my recipes for Germknödel and Mohnstrudel but it’s also used to fill Pofesen, Buchteln and Powidl-Tascherl. A delicious preserve made purely from plums, this authentic Powidl recipe doesn’t use added sugar. 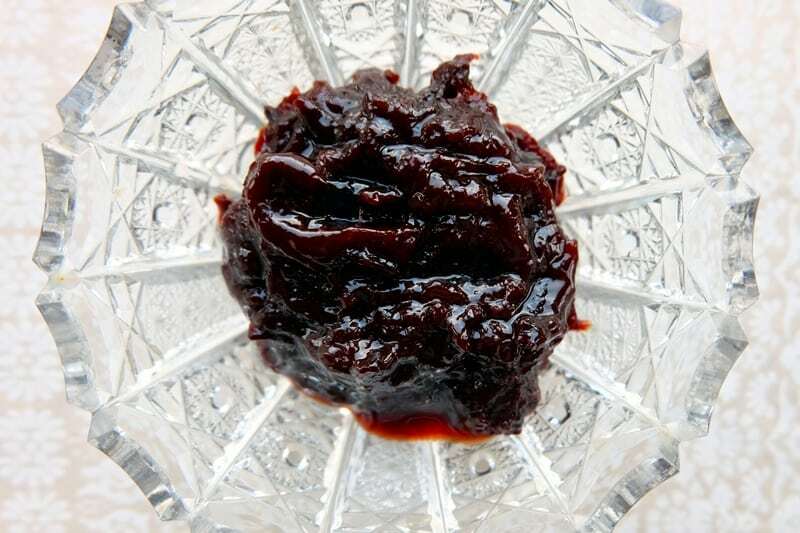 It’s made by simply cooking and reducing plums to a thick, spreadable consistency. Good-quality Powidl is not readily available to buy in shops, even in Austria, so I wanted to share the recipe for making Powidl at home. In Austria, we use Zwetschken (prunus domestica subsp. domestica) to make Powidl. You can see some photos of our Zwetschken tree at home in Austria in this post here. Without access to prunus domestica subsp. domestica, it’s best to find damsons (prunus domestica subsp. insititia) instead of the huge round plums you’ll find in the supermarkets. Either way, ensure to use very ripe and very sweet fruit for making this Powidl recipe. Please note again that real Powidl isn’t made with sugar and is therefore not a ‘jam’. This authentic Powidl preserve contains the pure essence of plums and won’t taste of sugar like typical jams. As a rule of thumb, you'll end up with 20% of the initial plum weight when making Powidl, for example 5kg of plums will cook down to 1kg of Powidl. Take a quantity of Zwetschken/damsons/plums (e.g. use 2.5kg to make 500g of Powidl), halve and de-stone the fruit. Add a few de-stoned dried plums if you like. It adds an additional layer of flavour complexity to the Powidl. You can add grated lemon zest, a little bit of ground cloves and/or cinnamon and some dark rum (Stroh if you are going all Austrian). 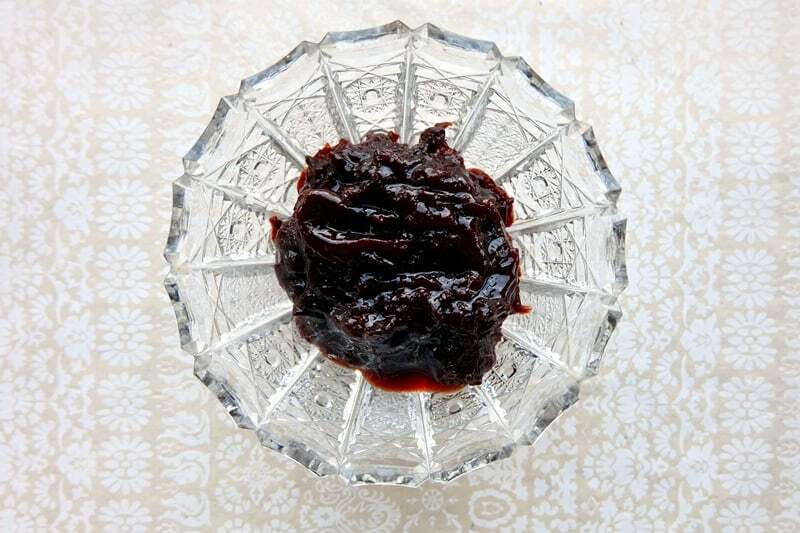 Continue until the plums have cooked down to a dark purple or brownish pulp - a viscous paste which is spreadable i.e. it shouldn't be too runny and not too thick. Real Powidl can’t be bought in supermarkets. However, I did see that Darbo Powidl sells here. I would like to add that I have never tried and tasted this product. Please also note that Powidl such as this is made with the addition of sugar. I love pancakes and am very excited indeed about all the pancake recipes coming out of this month’s #BreadBakers theme, kindly hosted by Mayuri Patel blogging at Austrian Palatschinken to Indian Dosa, from sorghum flour pancakes to these galettes de sarrasin, a buckwheat flour pancake recipe from the North of France. 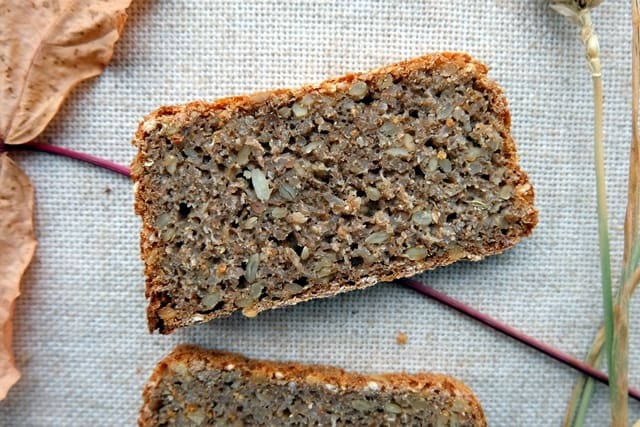 This recipe uses 100% buckwheat flour. The buckwheat flavours mingling with the ham, cheese, spinach and eggs are simply divine! 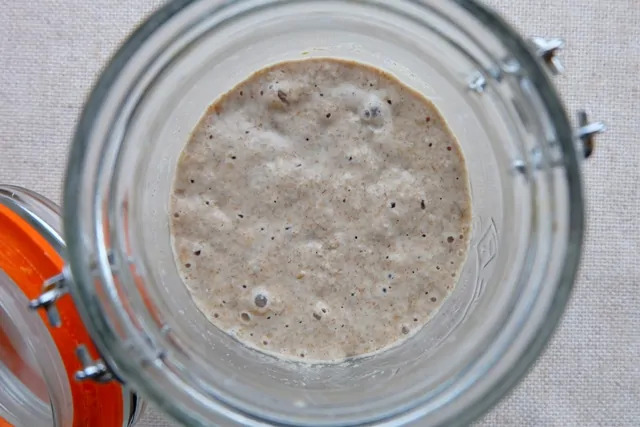 For a lighter buckwheat pancake, take a look at my recipe for buckwheat groats pancakes, using a mixture of buckwheat and wheat flour. Prepare the batter the night before baking the pancakes. 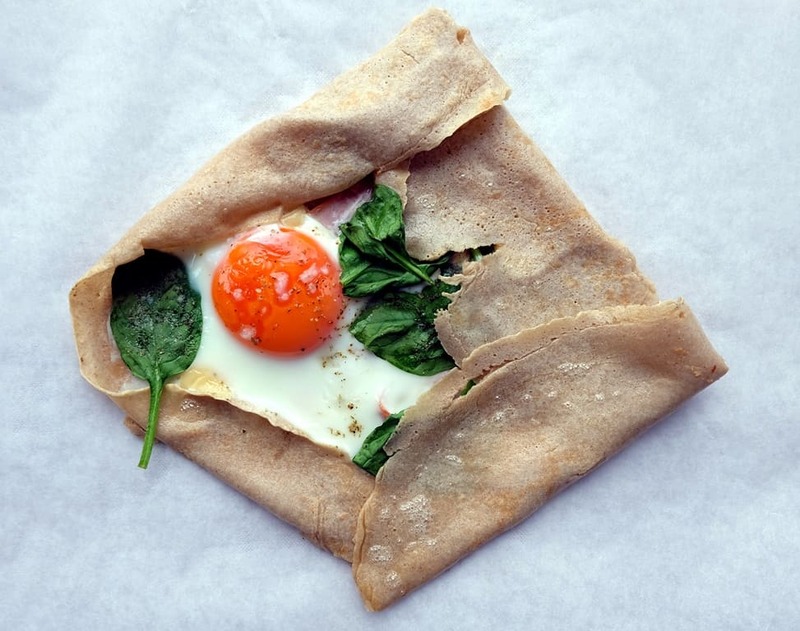 The galettes de sarrasin are easily assembled and make for a stand-out weekend breakfast! Make the batter in the evening before making the pancakes. 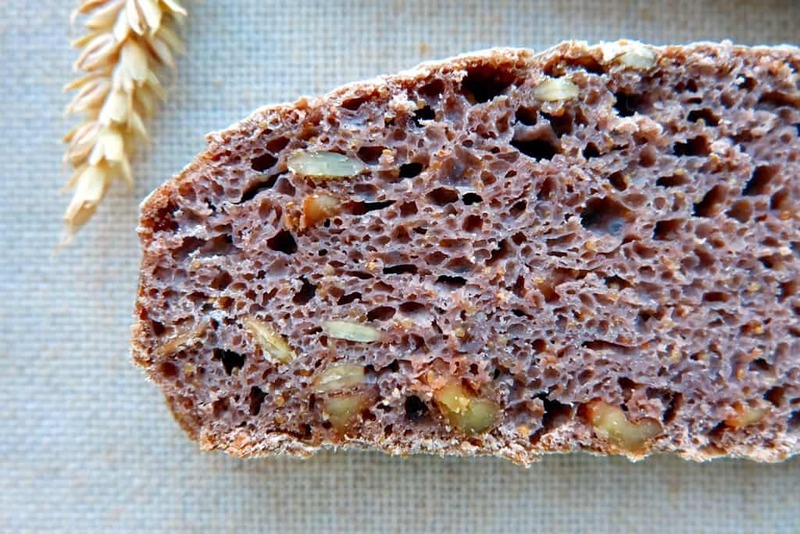 In a medium bowl, combine the buckwheat flour with the salt, milk, water and the egg. Whisk thoroughly. The batter should have the consistency of pouring cream. In the morning, heat a large frying pan (I used a pan 30 cm in diameter) to a medium heat and add about 1 teaspoon of butter to the pan and use a pastry brush to spread it evenly. Don’t be shy about the butter, it ensures the pancake can easily move around. Pour a good ladle of batter into the pan, lift the pan off the heat and swirl to distribute evenly. Place the pan back on the heat, and when the top is no longer looking wet and runny, flip the pancake. Place the slice of ham in the centre of the pancake. Add the egg on top of the ham, ensuring the egg yolk settles in the centre of the pancake. Scatter over the cheese, add salt and pepper and the baby spinach leaves, keeping the egg yolk centre uncovered. Fold the 4 edges into the galette, keeping the egg and bits of the filling visible. Place the pan under the grill to make the cheese melt and to cook the egg to the desired consistency. Slide off onto a plate and repeat. 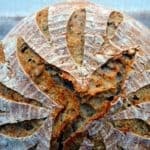 If you love the taste of buckwheat and want to bake more with this outstanding flour, take a look at my collection of the best buckwheat bread recipes. 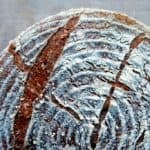 In the run up to this year’s Christmas celebrations, I wanted to share some of my favourite festive Christmas bread recipes. 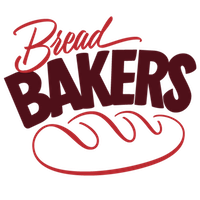 The list below features some of my own recipes as well as breads posted by fellow food writers and bloggers. Bread can play an integral part at various festive meal occasions and I have therefore divided my write-up into three categories: sweet breads, centre pieces and dinner rolls. Sweet Christmas breads are of course still a core focus point for festive preparations. 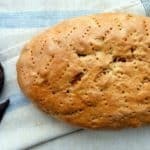 Starting with my favourite recipes for sweet Christmas breads, here are some options which are both tasty and fun to bake. Chocolate Panettone by Bread & Companatico – This panettone bread is based on natural leaven (pasta madre) which is the traditional stiff sourdough Italian bakers tend to use and flavoured with the grated zest of organic lemons and oranges. I don’t usually add the candied citrus and orange peel as suggested in the recipe. 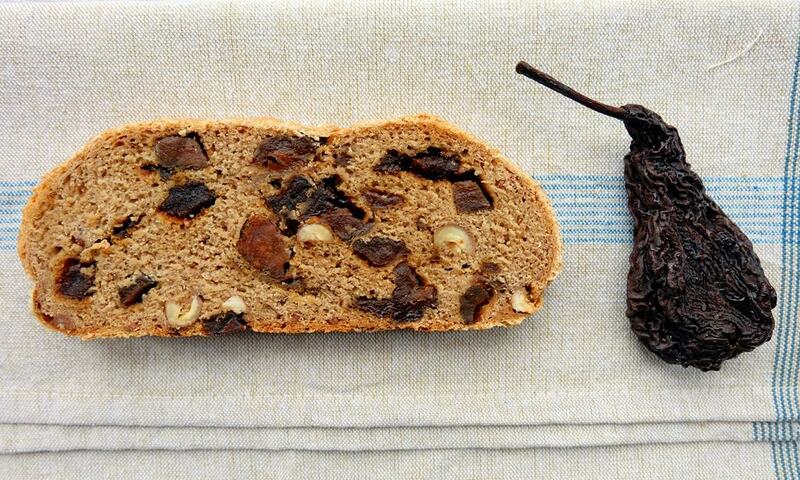 Weihnachtsbrot by Ploetzblog (in German) – A recipe that uses a cinnamon-spiced baked apple puree, cinnamon, almonds as well as a range of spices for a juicy loaf of bread that goes well with butter and jam. 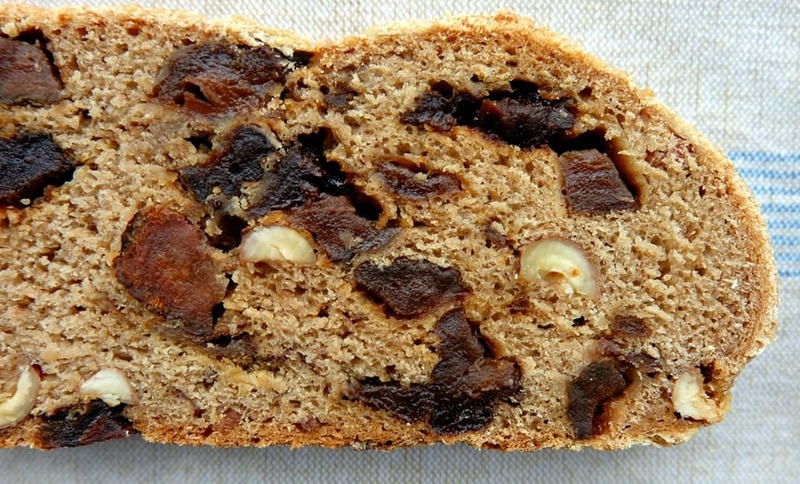 Christmas Fruit Bread by Andrew Whitley – Using an overnight sponge and a rum-soaked fruit and nut mix, this bread is a more traditional option. 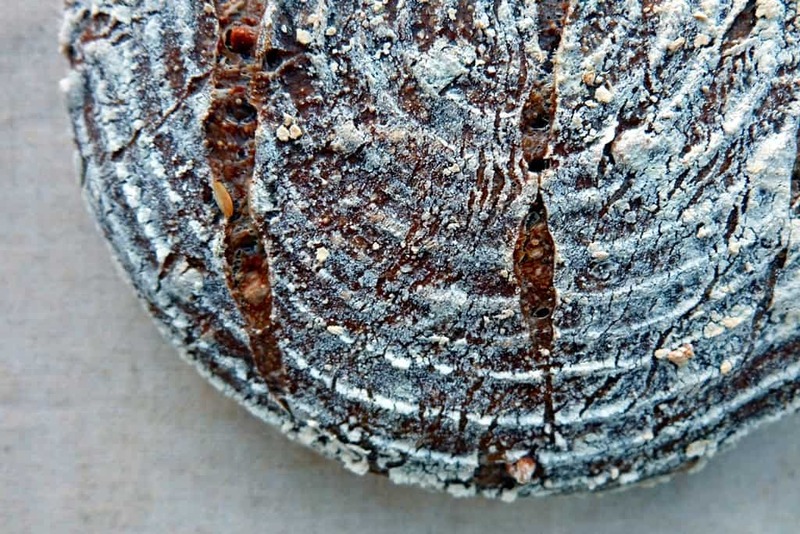 Julebolle by Trine Hahnemann – Scroll down to the Julebolle recipe for Christmas Danish with spices and raisins (I tend to leave out the candied peel). Serve with blue cheese. Christmas Stollen – My own recipe for a Christmas Stollen made with all natural ingredients and homemade pistachio marzipan. Next, think about your festive table setting. Whether you’re planning Christmas dinner or a special afternoon tea, bring it all together with a stunning bread centrepiece. Try one of the following options. 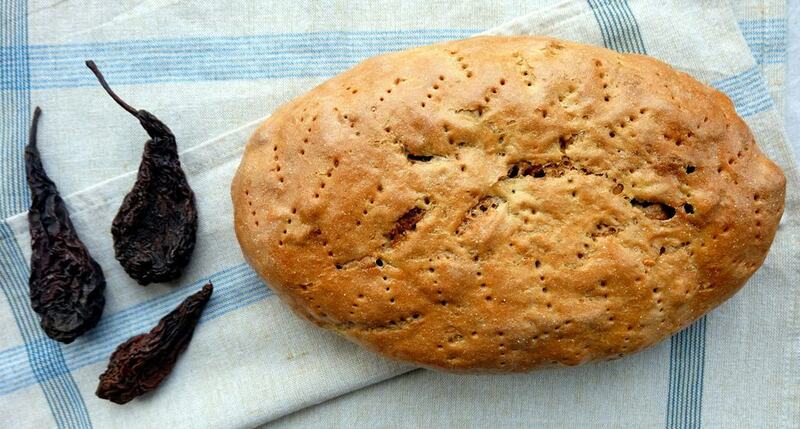 Christmas Star Twisted Bread Recipe – Gorgeous sweet bread swirled with jam. If you’re serving afternoon tea, this will be your show stopper. Decoratively shaped and cut baguettes – Flour. Water. Yeast. Salt. These four simple ingredients comprise the baguette. 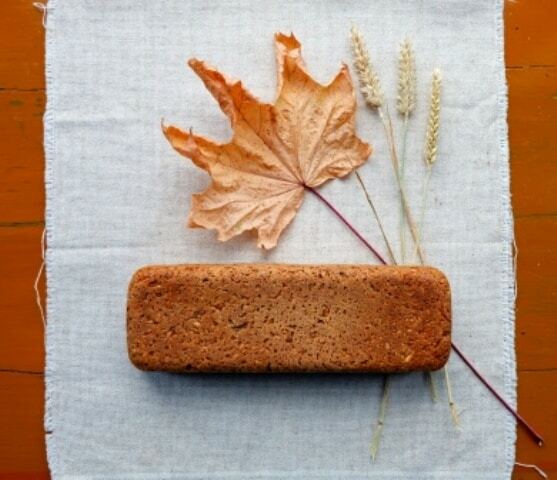 The fifth ingredient – time – makes this beautiful loaf. Decorative cuts and shaping add flair. 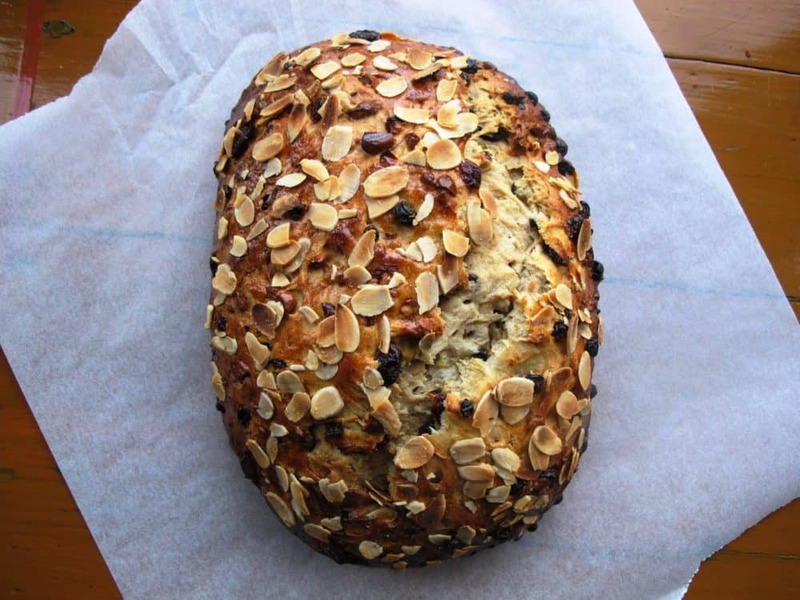 Orange & Anise Snowflake Bread – Best served for brunch or simply with a strong cup of coffee or tea. Filled brioche centrepiece with baked Camembert – This is an impressive option for a rich festive starter. Celebrating Christmas in Austria, my mum serves parsley-crusted rainbow trout with potatoes, butterhead lettuce and Austrian bread rolls for dinner on Christmas Eve. 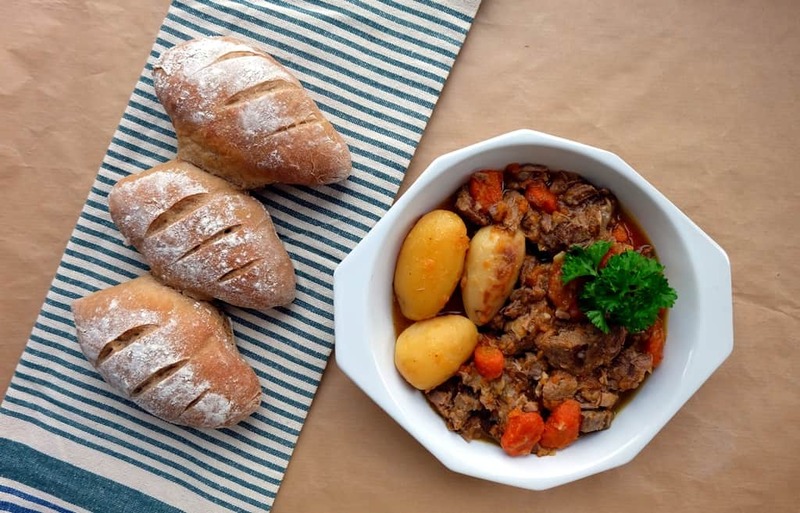 If you’re also looking to enhance your Christmas meal with some delicious homemade dinner rolls, here are some good recipe options. Austrian Handsemmeln (in German) – Semmeln are the most popular Austrian bread rolls and this recipe shows you how to craft Semmeln by hand. 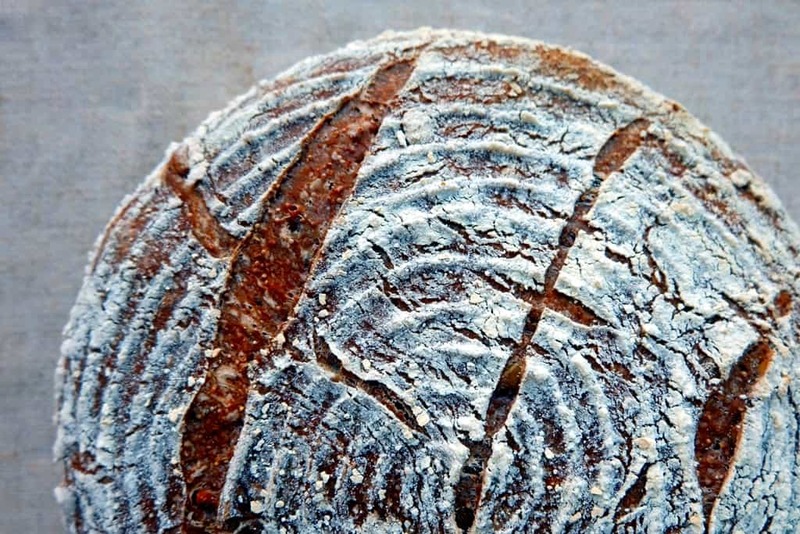 A recipe for beautifully simple artisanal rolls. Austrian Salzstangerl – Not strictly speaking rolls, but small Austrian breads decorated with salt and caraway seeds. 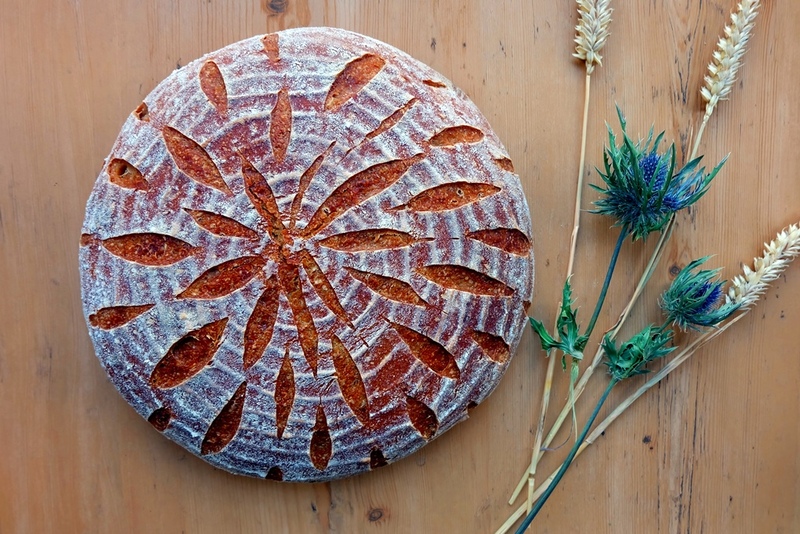 How did bread enhance your Christmas celebrations? 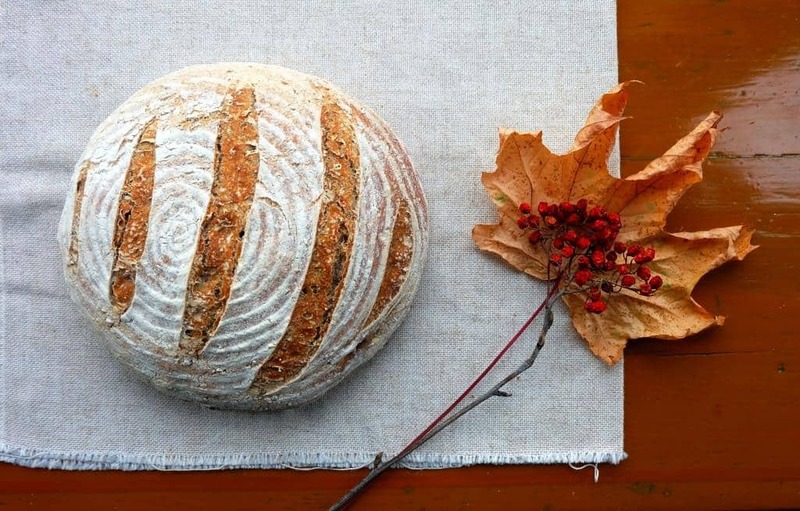 Share your festive bread notes and pics in the comments below!